Visual learner? Watch me make this Classic Yellow Cake from start to finish! Do you have any food pet peeves? Whether it’s the way people pronounce things like “minlk instead of milk” or a dead wrong pairing like grits with sugar? I have so many. I normally keep them to myself but sometimes I just have to vent. One food pet peeve I have is when people call yellow cake vanilla cake. I know, what’s the big deal right? I try my best to ignore it but look, it’s just not a vanilla cake okay. Whew. I feel better. Although subtle, yellow cake is truly in a class by itself. That gorgeous natural yellow color and that buttery-vanilla taste and aroma and that perfectly moist and tender crumb. It’s a classic and everyone should have a tried and true recipe! 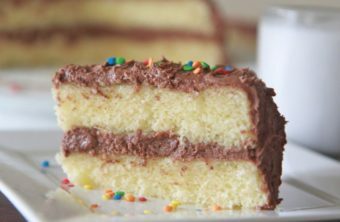 I posted one of my favorite tried and true yellow cake recipes a few years ago and it’s become the most infamous recipe on my blog. Some people LOVE IT (me included) and some people HATE IT! The funny thing is, after talking to other food bloggers, their yellow cakes are also pretty infamous. What’s up with that!?! I’m convinced you have to hold your mouth a certain way and twerk while mixing it. The most common mistake reported with that recipe was the middle sinking. I thought about removing the recipe but figured that wouldn’t be fair to those who love it and it really is still my favorite yellow cake recipe. So I decided to troubleshoot. I’ve been trying to troubleshoot that cake for years! Yes, YEARS!!! I’m a stubborn Taurus and there is just something about recipes (if they mess up) that provides a challenge that I must accept! However, as promised, I’ve got another yellow cake recipe that I think will be a hit for all. It’s a bit more stable with all-purpose flour, more leavening, more sugar and a couple extra yolks to kick up the fat content. Fat and moisture is a yellow cakes friend. 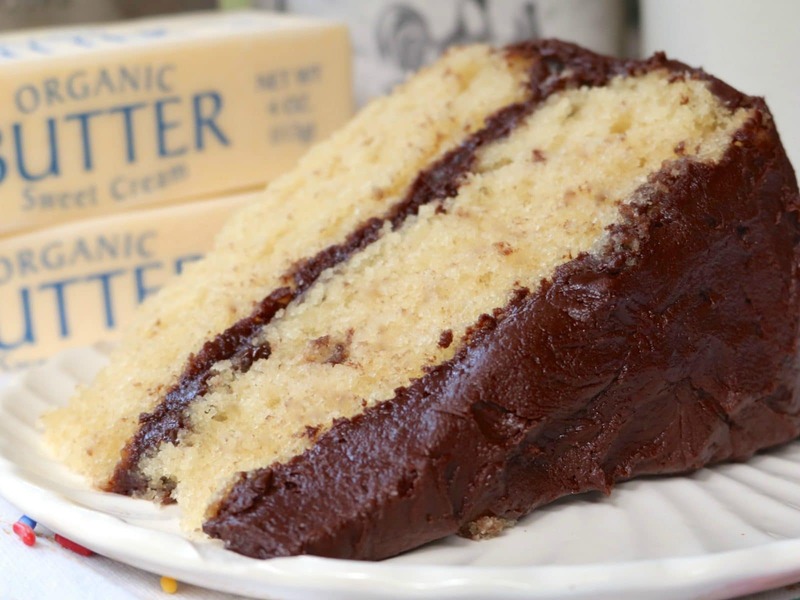 It’s a classic all-butter yellow cake but I’ve also bumped up the buttery flavor even more by adding in some butter flavoring. That’s optional, but yummers! I’ve made this cake four times so far and my boys prefer this one over the other one. I really do love them both! The first yellow cake has a very light and fluffy texture (almost melt in your mouth style) with an all-butter flavor. This new yellow cake recipe is fluffy but with a tighter crumb. This yellow cake recipe tastes more like the kind my grandmother makes. For some reason, I prefer the crumb of this cake on day 2. It gets a bit tighter and moister, just be careful not to overbake! 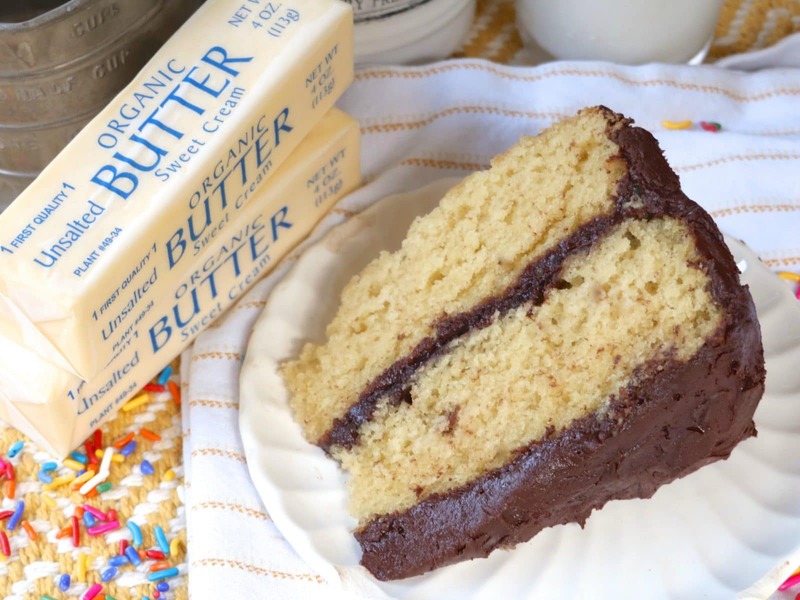 I used this Old-Fashioned Chocolate Frosting to frost this yellow cake! Get it here! Line the bottom of two, round 9-inch cake pans with a parchment paper circle. Grease and lightly flour the pans. Set aside. 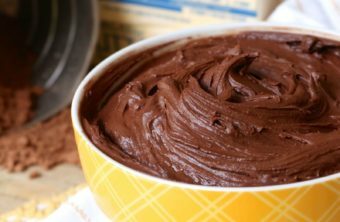 In a medium-size bowl, sift together flour baking powder, baking soda, and salt. Set aside. In a large bowl cream together sugar and butter. Mix in eggs and yolks, one at a time, mixing after each egg. Mix in vanilla extract and butter flavoring. Add the dry ingredients into the wet ingredients, alternating with the buttermilk. Let batter rest for 5 minutes. 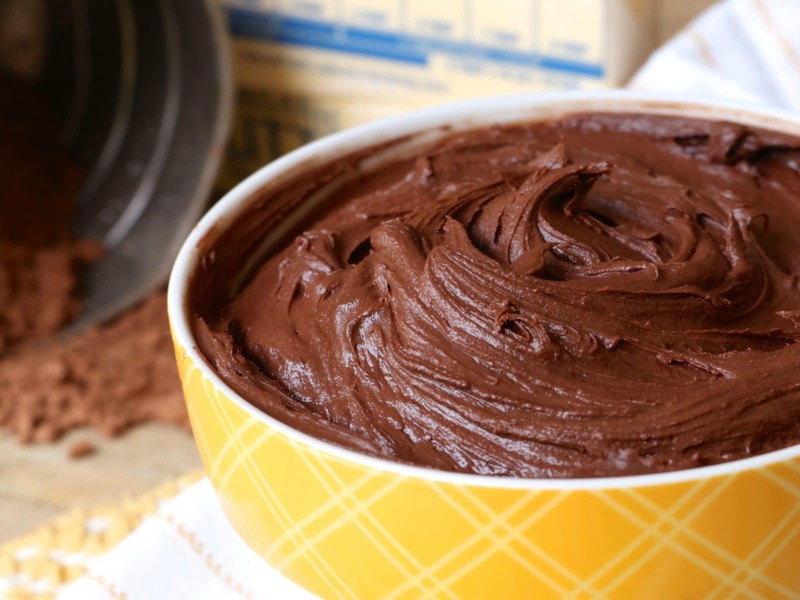 Pour batter evenly into prepared pans and use an offset spatula to spread into an even layer. Bake for 30-35 minutes (may need a tad bit longer) or until golden around the edges and moist crumbs cling to a toothpick inserted into the center. Place on a cooling rack until pans are warm enough to touch and then carefully remove cake from pans and allow to cool completely. Want More Recipes Like This? This cake was so good! Mine turned out kinda dense. Any thoughts on how to prevent that? I made this cake 4 the 1st time last night….hunni…lemme tell u sumthin…..absolutely my go 2 yellow cake recipe. Tks!!! Can I use this recipe for cupcakes too? May I add chop pecans to this recipe and if so, should I use 1 or 1/2 cup? Ok I’m little slow so I would need 4 eggs total? 2 eggs and then 2 more eggs for just the yolk? I made this recipe last night and I LOVE this recipe! The butter extract is needed and what I was missing when trying to make a yellow cake from scratch. Also, I used cake flour instead and this recipe is IT! I used homemade strawberry cream cheese frosting for the cake. Actually I used your REAL cream cheese frosting recipe and just added strawberries. Thank you Monique. You never fail!